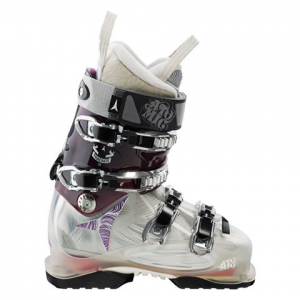 Atomic's award-winning Women's 110 Tracker Boot is a versatile boot that performs perfectly anywhere on the mountain. These boots have a narrow width with Atomic's +LiveFit Performance for an immediate custom fit. They have tons of support and minimal flexibility, perfect for superior downhill performance. The flex index is 110. However, the wearer can open the Power Control Release to add at least 20 degrees of cuff movement for more comfortable hiking or backcountry skiing. Other features of the Tracker 110 Boot include a carabiner buckle, Atomic's super durable enduro chassis, a 35 mm strap and a 1 mm offset shell for a great stance. These award winning boots have comfortable Ridge Walker soles for all day support on rocky ridge lines. An asymmetrical Pro T2 Liner has an anatomical fit for superior comfort. The heel and forefoot also have heat molding for an automatically customizable shape. Last but not least, the Tracker 110 comes in stylish purple and crystal coloring. Designed for serious versatility, these are the ideal boots for women who enjoy exploring all of the mountain.